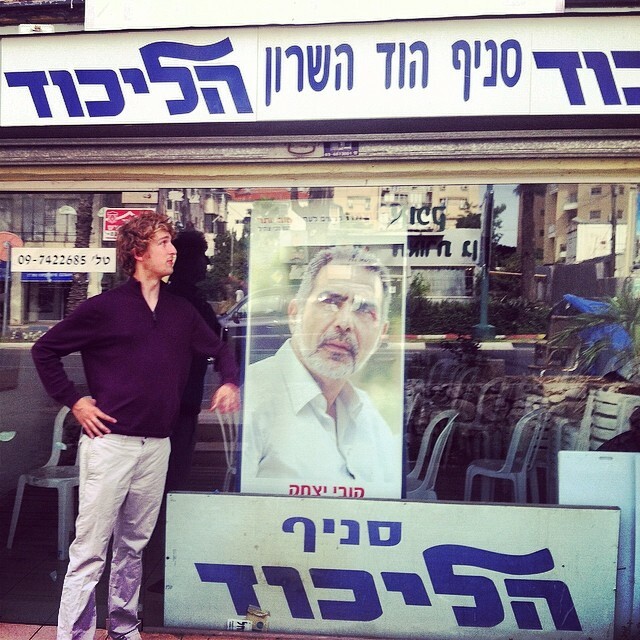 Hanging at the local Likud office in Hod HaSharon. With Israel’s elections in just under a week, it’s worth looking at the impact that Prime Minister Bibi Netanyahu’s speeches had (or didn’t have) on Israeli politics. In short, it’s hard to tell if it had any impact. Bibi’s popularity seems to be up, but his Likud party barely moved in the polls at all. What is for sure, is that plenty of Arab commentators strongly supported it. So what’s likely to happen? In all likelihood, Netanyahu will remain Prime Minister because the parties on the left are too disorganized to reach the 61 seats they need to have to form a government of their own. However, in a system with more political parties than most Americans could even imagine (my two favorites because of the level of amusement they provide are the Pirate Party and the Ale Yarok [Green Leaf] Party, whose symbol is the first two letters of cannabis in Hebrew), anything is possible. Finally, for anyone who wants to criticize the 47 Republican senators for the letter they sent to Iran, I would suggest reading up on history to see that this is not “unprecedented,” by any means. Here are my thoughts towards the more immediate aftermath of Bibi’s speech to Congress (original post here). In a simple sentence, Israeli Prime Minister Benjamin Netanyahu dispelled much of the criticism that has been leveled at his DC visit. I remember thinking as I listened to his speech before Congress that it was very interesting that the members of congress who did boycott it seemed to have known something the rest of us didn’t (I would be remiss if I didn’t include that the vast majority of them were endorsed by J Street). By the end of it, I realized that they had no idea what they were doing. In fact, each and every one of them should be asked what exactly was so offensive in the speech that they viewed it worthy of skipping out on. Rather than sabotaging (leave it to Salon to make such a claim) Obama, Bibi was in fact extremely deferential to Obama, despite the fact that some of Obama’s top aides are currently working to defeat Netanyahu in Israel (yes, you read that correctly; top Obama staffers are working to undermine Netanyahu. Now that is sabotage). It is worth remembering that Iran is a country that just built a mock US aircraft carrier for the sole purpose of blowing it up. However, they are being treated like a country that we can reasonably deal with. In fact, Netanyahu articulated the case against the current deal by appealing to both history and the future. Put simply, and especially in light of the fact that Purim (a holiday where Persians sought to eradicate the Jewish people) occurred the day after his speech, “the Jewish people, [who had been] stateless, defenseless, voiceless and powerless” now have the means to defend themselves, and will do so if it comes to that. Looking to the future, he underscored how Iran will be ensured a bomb within ten years given the “sunlight” clause in the deal that in essence renders it useless by 2025 (he also correctly highlighted that “a decade may seem like a long time in political life, but it’s the blink of an eye in the life of a nation.”). It seemed clear to me that in both his speeches to both AIPAC and the US Congress that Bibi more than got his point across (as Breitbart points out, he managed to win over both the left and the right, with even Rush Limbaugh praising John Boehner for having the courage to invite Netanyahu in the first place). It’s also not like he’s the only one pointing this out (and even CNN confirmed his major claims). Well doesn’t that destroy the narrative that has been promoted about this entire speech? In my mind, it absolutely does. The claim that it politicized the US-Israel relationship is an important one, and needs to be addressed. The underlying assumption of this statement is that the relationship had not been politicized before this speech, and that is patently false. “In June 2010 the administration pushed, and the U.N. Security Council adopted, Resolution 1929, which “demands” that “Iran halt all enrichment activities.” But now the administration will endorse Iran’s “right” to an industrial-scale enrichment capability—a right, incidentally, that the administration denies to South Korea. Resolution 1929 also states that Iran is “prohibited from undertaking any activity related to ballistic missiles.” But Iran continues to manufacture and test ballistic missiles, the Supreme Leader Ali Khamenei demands they be mass produced, and Iran’s top nuclear negotiator is adamant that “we are not ready to discuss this matter with any foreigner.” All of which gives the lie to weak State Department protestations that a deal will halt the ballistic missile program. In December 2013, Mr. Obama personally assured a pro-Israel audience in Washington that, when it came to diplomacy, “no deal is better than a bad deal.” Now unnamed administration officials are selling the line that “the alternative to not having a deal is losing inspections, and an Iran ever-closer to having the fissile material to manufacture a weapon.” In other words, virtually any deal is better than no deal. In March 2012, Mr. Obama insisted “my policy is not containment, my policy is to prevent them from getting a nuclear weapon.” He has said as much on some 20 other occasions. But the deal being contemplated now, with a sunset provision that will ultimately give Iran the right to enrich in whatever quantities and to whatever levels it wants, is neither prevention nor containment. When also considering the drop in Democratic support for Israel, it’s hard to blame a single speech for the politicization of the relationship between the two countries (this makes no mention of how Netanyahu is currently viewed more favorably than Obama…by Americans). That said, it is critical that Israel remain a bipartisan issue for the continued strength of the relationship between the two countries (with liberal Democrats like Alan Dershowitz acting as some of Netanyahu’s strongest defenders), especially at a time like this. Much ink was spilled before Netanyahu spoke to Congress, and it’s not likely to stop any time soon. Regardless of that fact, I’m glad he made his case. I’m gladder still that the vast majority of congress (and the American people) chose to listen. Reblogged this on Don Mathis – Kinetic Social.